"Chinese legislature" redirects here. For the legislature of the Republic of China, see Legislative Yuan. Not to be confused with People's National Congress. The National People's Congress (usually abbreviated NPC) is the national legislature of the People's Republic of China. With 2,980 members in 2018, it is the largest parliamentary body in the world. The National People's Congress meets in full session for roughly two weeks each year and votes on important pieces of legislation, and members are considered to be part-time legislators and are not paid to serve in the NPC. Much of the legislative power of the NPC is exercised by the Standing Committee of the National People's Congress which consists about 170 legislators and meets in continuous session. Members of the National People's Congress are allowed to simultaneously hold seats in other bodies of government and the party, and the NPC typically includes all of the senior officials in Chinese politics. By contrast, members of the NPCSC are not allowed to simulatenously hold positions in executive or judicial posts, and overlapping membership in the Politburo is typically limited to the chairman of the NPCSC. Under China's Constitution, the NPC is structured as a unicameral legislature, with the de jure power to legislate, oversee the operations of the government, and elect the major officers of state. Western media sources commonly describe the NPC as a de facto rubber stamping body while some academic sources have asserted that the NPC has recently emerged as an independent and influential force in Chinese politics. The NPC had never rejected a government bill until 1986, during the Bankruptcy Law proceedings, wherein a revised bill was passed in the same session. An outright rejection without a revised version being passed occurred in 2000 when a Highway Law was rejected, the first occurrence in sixty years of history. Moreover in 2015, the NPC refused to pass a package of bills proposed by the State Council, insisting that each bill require a separate vote and revision process. In recent years, the NPC has made significant changes to draft legislation proposed by the government, and it is possible for legislation to be stalled by interest groups of political controversy. According to the NPC, its annual meetings provide an opportunity for the officers of state to review past policies and to present future plans to the nation. In theory, the NPC is the highest organ of state power in China, and all four PRC constitutions have vested it with great lawmaking powers. Most Western media have characterized the NPC as a rubber stamp for decisions already made by the state's executive organs and the Communist Party of China. One of its members, Hu Xiaoyan, told the BBC in 2009 that she has no power to help her constituents. She was quoted as saying, "As a parliamentary representative, I don't have any real power." In 2014, the CPC pledged to protect the NPC's right to "supervise and monitor the government," provided that the NPC continue to "unswervingly adhere" to the party's leadership. However this characterization is disputed, as the NPC has made significant changes to draft legislation. Since the 1990s, the NPC has become a forum for mediating policy differences between different parts of the Party, the government, and groups of society. The NPC elects the Chairman, Vice Chairmen, Secretary-General and other members of its Standing Committee. It also elects the President of the People's Republic of China and the Vice President of the People's Republic of China. NPC also appoints the Premier of the State Council and many other crucial officials to the central state organs. The NPC also has the power to remove the above-mentioned officials from the office. This includes examining and approving the report on the plan for national economic and social development and on its implementation, report and central budget, and more. The establishment of the Hong Kong Special Administrative Region, the Macao Special Administrative Region, Hainan Province and Chongqing Municipality and the building of the Three Gorges Project on the Yangtze River were all decided by the NPC. The drafting process of NPC legislation is governed by the Organic Law of the NPC (1982) and the NPC Procedural Rules (1989). It begins with a small group, often of outside experts, who begin a draft. Over time, this draft is considered by larger and larger groups, with an attempt made to maintain consensus at each step of the process. By the time the full NPC or NPCSC meets to consider the legislation, the major substantive elements of the draft legislation have largely been agreed to. However, minor wording changes to the draft are often made at this stage. The process ends with a formal vote by the Standing Committee of the NPC or by the NPC in a plenary session.However, it is not completely without influence. It functions as a forum in which legislative proposals are drafted and debated with input from different parts of the government and outside technical experts. However, there are a wide range of issues for which there is no consensus within the Party and over which different parts of the party or government have different opinions. Over these issues the NPC has often become a forum for debating ideas and for achieving consensus. In practice, although the final votes on laws of the NPC often return a high affirmative vote, a great deal of legislative activity occurs in determining the content of the legislation to be voted on. A major bill such as the Securities Law can take years to draft, and a bill sometimes will not be put before a final vote if there is significant opposition to the measure. One important constitutional principle which is stated in Article 8 of the Legislation Law of the People's Republic of China is that an action can become a crime only as a consequence of a law passed by the full NPC and that other organs of the Chinese government do not have the power to criminalize activity. This principle was used to overturn police regulations on custody and repatriation and has been used to call into question the legality of re-education through labor.In practice, there is no mechanism to verify constitutionality of statute laws, meaning that local administrations could bypass the constitution through Administrative laws. The legislative process of the NPC works according to a five year work plan drafted by the Legislative Affairs Committee  Within the work plan, a specific piece of legislative is drafted by a group of legislators or administrative agencies within the State Council, these proposals are collected into a yearly agenda which outlines the work of the NPC in a particular year. This is followed by consultation by experts and approving in principle by the Communist Party. Afterwards, the legislation undergoes three readings and public consultation. The final approval is done in a plenary session in which by convention the vote is near unianmous. The NPC meets for about two weeks each year at the same time as the Chinese People's Political Consultative Conference, usually in the Spring. The combined sessions have been known as the two meetings. Between these sessions, power is exercised by the Standing Committee of the National People's Congress which contains about 150 members. The sessions have become media events because it is at the plenary sessions that the Chinese leadership produces work reports. Although the NPC has thus far never failed to approve a work report or candidate nominated by the Party, these votes are no longer unanimous. It is considered extremely embarrassing for the approval vote to fall below 70%, which occurred several times in the mid-1990s. More recently, work reports have been vetted with NPC delegates beforehand to avoid this embarrassment. In addition, during NPC sessions the Chinese leadership holds press conferences with foreign reporters, and this is one of the few opportunities Western reporters have of asking unscripted questions of the Chinese leadership. A major bill often takes years to draft, and a bill sometimes will not be put before a final vote if there is significant opposition to the measure. An example of this is the Property Law of the People's Republic of China which was withdrawn from the 2006 legislative agenda after objections that the law did not do enough to protect state property. China's laws are usually submitted for approval after at most three reviews at the NPC Standing Committee. However, the debate of the Property Law has spanned nine years, receiving a record seven reviews at the NPC Standing Committee and stirring hot debates across the country. The long-awaited and highly contested Property Law was finally approved at the Fifth Session of the Tenth National People's Congress (NPC) on 16 March, 2007. Among the 2,889 deputies attending the closing session, 2,799 voted for it, 52 against it, 37 abstained and one didn't vote. The NPC consists of about 3,000 delegates. Delegates to the National People's Congress are elected for five-year terms via a multi-tiered representative electoral system. Delegates are elected by the provincial people's assemblies, who in turn are elected by lower level assemblies, and so on through a series of tiers to the local people's assemblies which are directly elected by the electorate. There is a limit on the number of candidates in proportion to the number of seats available. At the national level, for example, a maximum of 110 candidates are allowed per 100 seats; at the provincial level, this ratio is 120 candidates per 100 seats. This ratio increases for each lower level of people's assemblies, until the lowest level, the village level, has no limit on the number of candidates for each seat. However, the Congress website says "In an indirect election, the number of candidates should exceed the number to be elected by 20% to 50%." The requirement that there be more candidates than seats contrasts with Soviet procedure in which the number of candidates were identical to the number of seats. Hong Kong has had a separate delegation since the 9th NPC in 1998, and Macau since the 10th NPC in 2003. The delegates from Hong Kong and Macau are elected via an electoral college rather than by popular vote, but do include significant political figures who are residing in the regions. The electoral colleges which elect Hong Kong and Macau NPC members are largely similar in composition to the bodies which elect the chief executives of those regions. In order to stand for election, the candidate must be validated by the Presidium of the electoral college and must agree to uphold the constitution of the PRC and the Basic Law. Each elector can vote for the number of seats from the qualified nominees. Under the one country, two systems policy, the Communist Party of China does not operate in Hong Kong or Macau, and none of the delegates from Hong Kong and Macau are formally affiliated with the CCP. However, the electoral committee which elects the Hong Kong and Macau delegates are mainly supporters of the pro-Beijing pan-establishment camp, and so far, all of the candidates that have been elected from Hong Kong and Macau are from the pro-Beijing pan-establishment camp. In contrast to Mainland China where a political opposition parties are not allowed, the political opposition controls about one quarter of the electoral college, opposition candidates have been allowed to run for NPC seats, although no opposition candidate has ever been elected. In the most recent election in 2017, the pan-democrats opposition declined to endorse candidates because they believed that constitutional changes made getting a seat useless. In this election, the Presidium refused to allow the candidacy of several Occupy and pro-independence candidates on the grounds that they refused to sign the electoral form pledging to uphold the constitution and the Basic Law. However, the Presidium did allow the candidacy of several moderate pan-democratic figures who were unable to be elected. Although the pan-democratic opposition in Hong Kong does not have enough votes to elect an opposition candidate, they have expressed the belief that they have enough seats to influence which pro-Beijing figures can get elected. The current method of electing SAR delegations began after the handovers of sovereignty to the PRC. Between 1975 and the handovers, both Hong Kong and Macau were represented by delegations elected by the Guangdong Provincial Congress. The NPC has included a "Taiwan" delegation since the 4th NPC in 1975, in line with the PRC's position that Taiwan is a province of China. Prior to the 2000s, the Taiwan delegates in the NPC were mostly Taiwanese members of the Chinese Communist Party who fled Taiwan after 1947. They are now either deceased or extremely old, and in the last three Congresses, only one of the "Taiwan" delegates was actually born in Taiwan (Chen Yunying, wife of economist Justin Yifu Lin); the remainder are "second-generation Taiwan compatriots", whose parents or grandparents came from Taiwan. The current NPC Taiwan delegation was elected by a "Consultative Electoral Conference" (协商选举会议) chosen at the last session of the 11th NPC. The People's Liberation Army has had a large delegation since the founding of the NPC, making up anywhere from 4 percent of the total delegates (3rd NPC), to 17 percent (4th NPC). Since the 5th NPC, it has usually held about 9 percent of the total delegate seats, and is consistently the largest delegation in the NPC. In the 12th NPC, for example, the PLA delegation has 268 members; the next largest delegation is Shandong, with 175 members. For the first three NPCs, there was a special delegation for returned overseas Chinese, but this was eliminated starting in the 4th NPC, and although overseas Chinese remain a recognized group in the NPC, they are now scattered among the various delegations. The PRC also recognizes 55 minority ethnic groups in China, and there is at least one delegate belonging to each of these groups in the current (12th) NPC. These delegates frequently belong to delegations from China's autonomous regions, such as Tibet and Xinjiang, but delegates from some groups, such as the Hui people (Chinese Muslims) belong to many different delegations. The Presidium of the NPC is a 178-member body of the NPC. It is composed of senior officials of the Communist Party of China (CPC), the state, non-Communist parties and All-China Federation of Industry and Commerce, those without party affiliation, heads of central government agencies and people's organizations, leading members of all the 35 delegations to the NPC session including those from Hong Kong and Macao and the People's Liberation Army. It nominates the President and Vice President of China, the Chairman, Vice-Chairman, and Secretary-General of the Standing Committee of the NPC, the Chairman of the Central Military Commission, and the President of the Supreme People's Court for election by the NPC. Its functions are defined in the Organic Law of the NPC, but not how it is composed. Under the Constitution of the People's Republic of China, the Communist Party of China is guaranteed a leadership role, and the National People's Congress therefore does not serve as a forum of debate between government and opposition parties as is the case with Western parliaments. At the same time, the Constitution makes the Party subordinate to laws passed by the National People's Congress, and the NPC has been the forum for debates and conflict resolution between different interest groups. The Communist Party maintains control over the NPC by controlling delegate selection, maintaining control over the legislative agenda, and controlling the constitutional amendment process. The Great Hall of the People, where both the National People's Congress and the National Congress of the Communist Party of China convene. 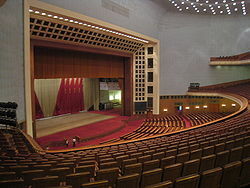 The ruling Communist Party of China maintains control over the composition of people's congresses at various levels, especially the National People's Congress. At the local level, there is a considerable amount of decentralization in the candidate preselection process, with room for local in-party politics and for participation by non-Communist candidates. The structure of the tiered electoral system makes it difficult for a candidate to become a member of the higher level people's assemblies without the support from politicians in the lower tier, while at the same time making it impossible for the party bureaucracy to completely control the election process. One such mechanism is the limit on the number of candidates in proportion to the number of seats available. At the national level, for example, a maximum of 110 candidates are allowed per 100 seats; at the provincial level, this ratio is 120 candidates per 100 seats. This ratio increases for each lower level of people's congresses, until the lowest level, the village level, has no limit on the number of candidates for each seat. However, the Congress website says "In an indirect election, the number of candidates should exceed the number to be elected by 20% to 50%." The practice of having more candidates than seats for NPC delegate positions has become standard, and it is different from Soviet practice in which all delegates positions were selected by the Party center. Although the limits on member selection allows the Party leadership to block unacceptable candidates, it also causes unpopular candidates to be removed in the electoral process. Direct and explicit challenges to the rule of the Communist Party are not tolerated, but are unlikely in any event due to the control the party center has on delegate selection. Furthermore, the constitution of the National People's Congress provides for most of its power to be exercised on a day-to-day basis by its Standing Committee. Due to its overwhelming majority in the Congress, the Communist Party has total control over the composition of the Standing Committee, thereby allowing it to control actions of the National People's Congress. However, the Communist Party uses the National People's Congress as a mechanism to coordinate different interests, weigh different strategies and incorporate these views into draft legislation. Although Party approval is in effect essential for membership in the NPC, approximately a third of the seats are by convention reserved for non-Communist Party members. This includes technical experts and members of the smaller allied parties. While these members do provide technical expertise and a somewhat greater diversity of views, they do not function as a political opposition. Under Chinese law, the Communist Party is barred from directly introducing legislation into the NPC although the Party can ask that government ministries or individual members introduce legislation on behalf of the Party. The primary role of the Communist Party in the legislative process largely is exercised during the drafting phase of the legislation. Before the NPC considers legislation, there are working groups which study the proposed topic, and it is necessary for the Party leadership to agree "in principle" to any legislative changes. This process overlaps with the early drafting phase as particularly controversial or sensitive issues requires approval and consensus from the Party leadership. The Communist Party leadership plays a particularly large role in the approval of constitutional amendments. In contrast to ordinary legislation, which the Communist Party leadership approves the legislation in principle, and in which the legislation is then introduced by government ministers or individual National People's Congress members, constitutional amendments are drafted and debated within the Communist Party, approved by the Central Committee of the Party and then presented to the National People's Congress. In contrast to ordinary legislation, in which the process is largely directed by the Legislation Law, the process for constitutional revision is largely described by Party documents. Unlike ordinary legislation in which the NPC routinely makes extensive revisions to legislative proposals which have bee introduced to it, the changes to constitutional amendments from the draft approved by the party have been minor. In addition to passing legislation, the NPCSC interacts with local governments through its constitutional review process. In contrast to most Western nations, constitutional review is considered a legislative function and not a judicial one, and Chinese courts are not allowed to examine the constitutionality of legislation. The NPC has created a set of institutions which monitor local administrative measures for constitutionality. Typically, the Legislative Affairs Committee will review legislation for constitutionality and then inform the enacting agencies of its findings, and rely on the enacting agency to reverse its decision. Although the NPC has the legal authority to annul unconstitutional legislation by a local government, it has never used that power. ^ 第十三届全国人民代表大会第一次会议主席团和秘书长名单. 4 March 2018. ^ a b National People's Congress of the PRC. 中华人民共和国全国人民代表大会和地方各级人民代表大会选举法 [Election Law of the National People's Congress and Local People's Congress of the People 's Republic of China]. www.npc.gov.cn (in Chinese). Retrieved 18 June 2017. ^ "China Set to Make Xi Era Permanent With Sweeping Legal Overhaul". Bloomberg.com. 1 March 2018. Retrieved 4 March 2018. ^ "How China is ruled: National People's Congress". BBC News. 8 October 2012. Retrieved 4 March 2018. ^ "What makes a rubber stamp?". The Economist. Retrieved 4 March 2018. ^ "China's National Party Congress will open the way to a dictatorship for President Xi Jinping". ABC News. 5 March 2018. Retrieved 4 March 2018. ^ Riley, Charles. "China's rubber-stamp parliament: 3 things you need to know". CNNMoney. Retrieved 4 March 2018. ^ "Nothing to see but comfort for Xi at China's annual parliament". Reuters. 16 March 2017. Retrieved 4 March 2018. ^ Wee, Sui-Lee (1 March 2018). "China's Parliament Is a Growing Billionaires' Club". The New York Times. ISSN 0362-4331. Retrieved 4 March 2018. ^ Connor, Neil (4 March 2017). "Five things to watch out for at China's National People's Congress". The Telegraph. ISSN 0307-1235. Retrieved 4 March 2018. ^ Chen, Te-Ping (5 March 2016). "At China's Rubber-Stamp Parliament, Real Stamps Are All the Rage". WSJ. Retrieved 4 March 2018. ^ Elegant, Simon. "The National People's Congress: Rubber Stamp?". Time. ISSN 0040-781X. Retrieved 4 March 2018. ^ Michael Dowdle (Spring 1997). "The Constitutional Development and Operations of the National People's Congress". Columbia Journal of Asian Law. ^ "State Structure of the People's Republic of China". 中国人大网. The National People's Congress of the People's Republic of China. Retrieved 29 September 2016. ^ "The National People's Congress of the People's Republic of China". Retrieved 8 November 2016. ^ "How China is ruled: National People's Congress". BBC News. Retrieved 15 February 2017. ^ "Functions and Powers of the National People's Congress". The National People's Congress of the People's Republic of China. The National People's Congress. Retrieved 29 September 2016. ^ Stephen Green (2003). Drafting the Securities Law: The role of the National People’s Congress in creating China’s new market economy (PDF) (Report). Cambridge University. Archived from the original (PDF) on 14 July 2011. Retrieved 25 October 2010. ^ "Number of Deputies to All the Previous National People's Congresses in 2005 Statistical Yearbook, source: National Bureau of Statistics of China". Retrieved 30 June 2010. ^ "十一届全国人大代表将亮相:结构优化 构成广泛". Npc.people.com.cn. Retrieved 26 March 2012. ^ 12th Congress information from International Parliamentary Union. "IPU PARLINE Database: General Information". Retrieved 9 June 2013. ^ Xinhua News Agency. "New nat'l legislature sees more diversity". Npc.gov.cn. Retrieved 12 November 2013. ^ Fu, Hualing; Choy, D. W (2007). "Of Iron or Rubber? : People's Deputies of Hong Kong to the National People's Congress". SSRN Electronic Journal. doi:10.2139/ssrn.958845. ^ National People's Congress (27 February 2013). "Delegate list for the 12th National People's Congress". Npc.gov.cn. ^ Maurer-Fazio, Margaret; Hasmath, Reza (2015). "The contemporary ethnic minority in China: An introduction". Eurasian Geography and Economics. 56: 1. doi:10.1080/15387216.2015.1059290. ^ "National People's Congress Organizational System". China Internet Information Center. Retrieved 26 April 2014. ^ a b "Presidium elected, agenda set for China's landmark parliamentary session". Xinhua News Agency. 4 March 2013. Archived from the original on 9 May 2013. Retrieved 22 April 2013. ^ a b 林 (Lin), 峰 (Feng) (2011). 郑 (Cheng), 宇硕(Joseph Y. S.) (ed.). Whither China's Democracy: Democratization in China Since the Tiananmen Incident. City University of Hong Kong Press. pp. 65–99. ISBN 978-962-937-181-4. At pp. 68–69. ^ "The National People's Congress of the People's Republic of China". www.npc.gov.cn. ^ White, Stephen (1990). "The elections to the USSR congress of people's deputies March 1989". Electoral Studies. 9: 59. doi:10.1016/0261-3794(90)90043-8. ^ Saich, Tony (November 2015). "The National People's Congress: Functions and Membership". Ash Center for Democratic Governance and Innovation. This page was last edited on 24 April 2019, at 06:55 (UTC).